I can’t recover my old user so I created a new one but I am an old timer. Disclosure: I AM NOT CLAIMING ANYTHING. I would like to know your opinion on my pics. The difference in hair length is just 4 days ( before pic 11 days after hair cut, after pic 15 days after cut). I know. Different light, angle, etc. I am not a robot and neither is the person helping me taking the pics. Does anyone see any improvement or just longer hairs. Definite improvement ! I would say much more hair…what are you doing ? If you look at the first photo there are allot of black dots (tiny hairs that haven’t grown.) Some of the hairs are growing in different directions as well.It looks like the back of your head,the crown area so that could just be your swirl pattern,I don’t know.But there are definitely allot of small hairs that haven’t grown out yet. 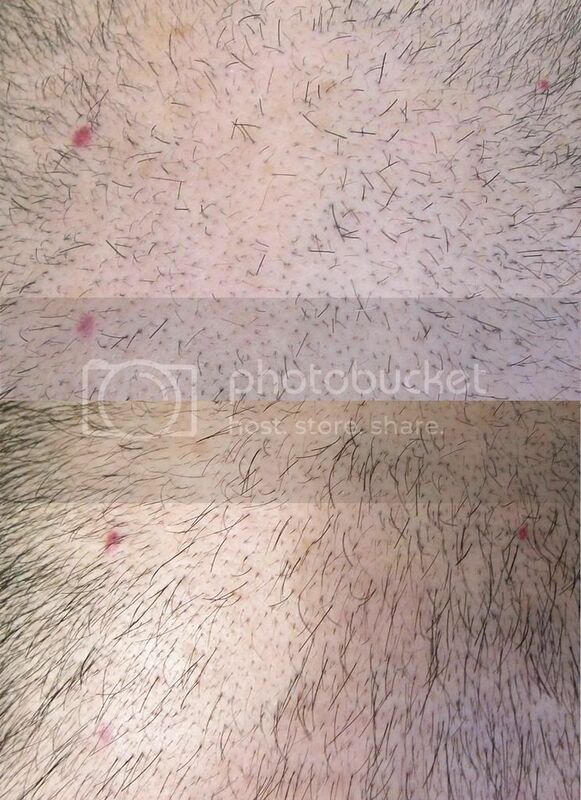 In the second photo,allot of those hairs have grown out,there is a visible increase in hair count & an improvement in appearance.Some of the hairs are thicker in calibre than others.There is still allot of hairs that haven’t grown out yet & when they do you will have even more coverage. I presume the red dots are marking the treated area? What did you do? Also, what was ur original user name? » I can’t recover my old user so I created a new one but I am an old timer. » Disclosure: I AM NOT CLAIMING ANYTHING. » I would like to know your opinion on my pics. » hair cut, after pic 15 days after cut). » person helping me taking the pics. » Does anyone see any improvement or just longer hairs. What in sam hell are we looking at here? It looks like you have longer hair in the second pic (no more no less); at the same time, I have a sneaking suspicion your next post will include a link to a certain piece of spam that’s been posted here before. thanks for your comments. It is what I wanted. Down to earth opinions. It is very easy to get carried away by initial improvements whether real or imagined. It is also sort of easy to get initial improvements and then no further improvement so they mean nothing. I will be patient and wait some months for further improvement if any. » thanks for your comments. It is what I wanted. Down to earth opinions. » no further improvement so they mean nothing. » I will be patient and wait some months for further improvement if any. You are going to tickle our testicles & just leave? Don’t be a tease,tell us what you have done.We are all friends here,you can tell us. » You are going to tickle our testicles & just leave? yea…hair-regrowth, are you using any drugs/topicals etc? What I am doing is controversial so I will wait some months to see if the improvement was real and if so whether it keeps working. If it doesn’t work there is no point in telling here what it is and get heavily insulted. If it works down the road I will get insulted anyway but I will have the results which is what matters. The photo is from my head’s top. The red spots are natural (I hate them but now they serve me as markings). If it finally works, as I hope, I will give you all the details but I doubt anyone will do it. » but now they serve me as markings). As I’ve said before, regardless of authenticity, someone will always cry foul.